I´m in Madrid. That should explain everything. I come back home and it´s all a non-stop whirl of seeing friends and family, hopping in and out of bars and museums and little shops, and more bars and a few galleries. And also cramming in a few meetings with clients, and taking the kids to the circus and the merry-go-round. A bit of sleep, now and then, when I can. No blogging. And now we´re off to Lisbon. So I thought that instead of a recipe, I´ll post a few addresses of favourite places. 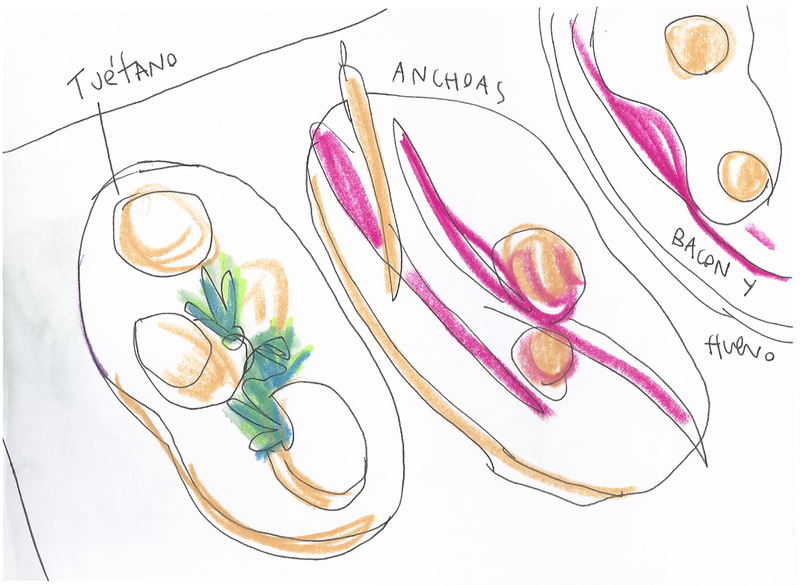 Above is a drawing of some of the pinchos served in Cuenllas, a very good (and expensive) bar in c/Ferraz where my father takes me for champagne and canapés. Go for the bone marrow, the anchovies and the butifarra. In c/Ponzano, Fide and El Doble, for the best cañas and seafood. Ask for the shrimp in Fide and the mojama in El Doble. For coffee with a view, the coffee shop in El Corté Inglés at Callao. Don´t miss the exhibition at the Juan March right now, Alexandr Deineka. Great churros are to be had in the morning in c/Santa Engracia, cafetería Forum. Gin&Tonics that will floor a grenadier in c/Apodaca, the bar just opposite nº6. More to follow when we´re back from Portugal. Posted by lobstersquad at 9:27 a. m.
Very cute and unique post. I do not understand the photo but it good to see this kind of photo and it is really interesting.